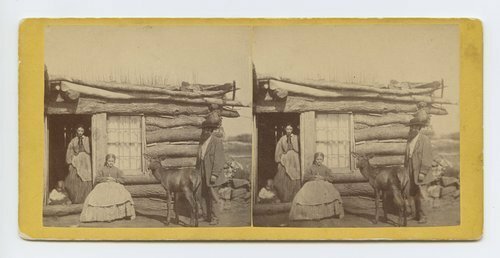 This stereograph shows unidentified adults and children with a tame elk posed in front of a log building at Clear Creek, Kansas. It is from Alexander Gardner's series, Across the Continent on the Union Pacific Railway, Eastern Division. Group with tame elk at ranch on Clear Creek Kansas.